Boston caught a school-record 191 passes for 2855 yards (14.9 avg.) and 34 touchdowns in college, including 85 for 1455 yards and 13 TDs in ’98, his last season. 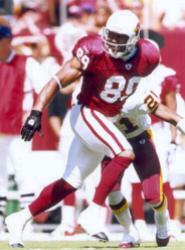 He chose to enter the 1999 NFL draft with a year of eligibility remaining and was chosen by the Cardinals in the first round (eighth overall). Boston caught 40 passes for 473 yards (11.8 avg.) and two touchdowns in a mediocre rookie season but moved into the starting lineup full-time in 2000 and had 71 receptions for 1156 yards (16.3 avg.) and 7 TDs. Big, fast, and able to run effectively after catching the ball, Boston also drew criticism for his attitude and off-field problems, although he showed greater maturity and dedication coming into 2001. Cardinals went 7-9 to finish fourth in the NFC East. Boston’s 2002 season was cut short halfway through by a knee injury and he ended up with 32 catches for 512 yards (16.0 avg.) and one TD. He signed a big free agent contract with San Diego in ’03 and caught 70 passes for 880 yards (12.6 avg.) and 7 TDs but clashed with his coaches and was traded to Miami in 2004. Boston received a four-game suspension for steroid use but ended up missing the entire season with a knee injury. He appeared in just five games in ’05 before reinjuring his knee. Boston signed with the Buccaneers in 2006 and was released following further off-field problems. He attempted a comeback with the Toronto Argonauts of the CFL in ’08 and appeared in one game, catching 2 passes for 16 yards, before a foot injury that required surgery forced him to the sidelines for good. Overall, Boston caught 315 passes for 4699 yards (14.9 avg.) and 25 touchdowns in the NFL. Of those totals, 241 receptions for 3739 yards (15.5 avg.) and 18 TDs came with the Cardinals.